Sara has spent the last 10 years listening. Trauma recovery is a long road and Sara's has required many tools. She's an RYT 500, Reiki II practitioner and a certified Sound Healing Practitioner working with Alchemy Crystal Bowls. She's been called to Shamanism and uses Celtic and Peruvian techniques in her sessions and classes (and own healing.) As she has peeled back the layers of complex PTS and as she has found what has worked for her own unique healing she was called to hold space for the processes of others and here she is. She is grateful that Yoga found her and she continues to expand her education and deepen her healing daily and she is honored to share space and light with all who attend Samsarafest. This is my second year participating. I'm a survivor. I'm a woman who is TTC and has miscarried multiple times. I'm in recovery. All of these things led to me finding and being a part of the story. 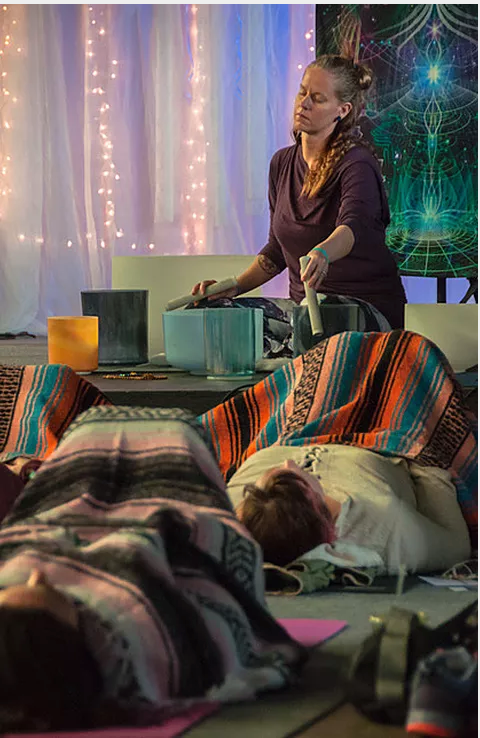 Invitation To Illumination (Sensuous Revival, Sonic Sorceress and Earth Tuned) Ajna light, alchemy sound bath, tuning forks vibe support and restorative yoga. We are so excited to have Sara with us at Samsarafest 2019! Check back for her festival schedule!